Ideal Website Team | "Getting a quality website is an investment not an expense." This chart illustrates how the strategic planner acts as a project coordinator between the various teams. 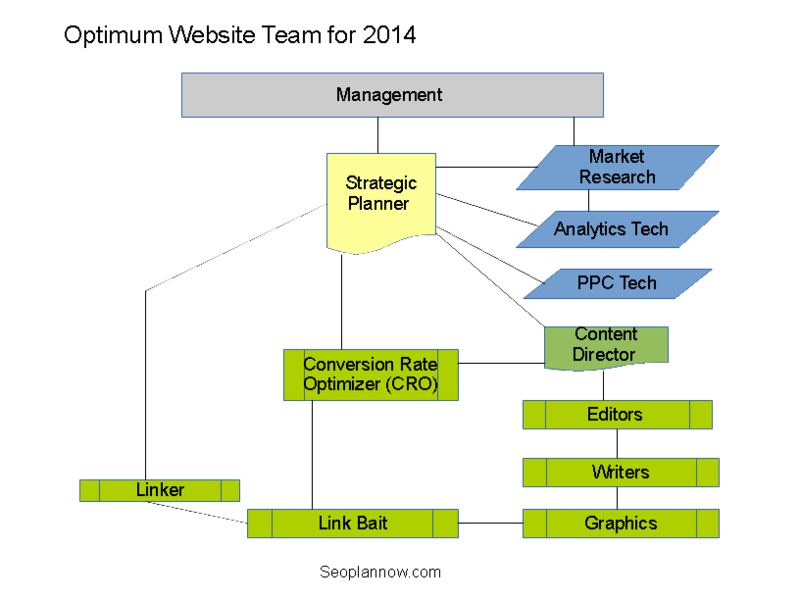 The strategic planner orders market research, works with the analytics people, and the paid advertising services. The content director is responsible for all the content that goes in the website. So the market research is given to the content director, and he instructs the writers to produce the content. The editors polish the work just like a professional news or magazine organization. The graphics artist support the content like a publishing house. Market research also helps locate link bait type content. The content team create the link bait and post to the website. The linker can then use the link bait to solicit links to the website. The conversion rate Optimizer is a consultant, who oversees the content, comments and approves content to be installed on the website. While there are many roles here, they can be a large organization with several people or a small organization wearing multiple hats. The chart shows the overall process, and the major elements needed. These can also be outsourced to individuals or two teams. The process scales at any level.